As every day is Mutts Day in our house, I don’t feel too bad about celebrating a day late. I do think it is great a whole day has been dedicated to honouring the mixed breed dog. After all, they are often the most misunderstood. They are also much more likely to end up in shelters. If you are lucky enough to share your life with one, you will also agree with how hard it is to find a key chains or stationary dedicated to your favourite breed. The world is full of “I Love My Schnauzer” bumper stickers. But finding one that proclaims devotion to the Heinz 57 is nearly impossible. For that reason alone I think these awesome dogs deserve their own day! Most of the dogs I’ve met online are mixed breeds adopted from shelters. That’s why it’s so odd that Shiva is currently the one of two mutts in our agility class. She was the only rescue in our life skills class and in our early obedience classes. I also think she was one of very few participating in the Canine Good Neighbour Test last June. Given how many there are in most communities it’s surprising that in my day-to-day life most of the dogs I see are purebreds. Or, at the very least, from a very recognizable heritage. Does this mean more dogs are being spayed or neutered? Will one day the mutt be a breed of the past? I have doubts about this. Growing up, I was taught to look down on mixed breed dogs. They were products of irresponsibility. Mutts were thought to be less-than, owned by criminals and other unsavory types. They were dogs one could not trust. They ran wild in the streets and had unpredictable natures. I assumed they also had health problems due to the mixing of genetics not meant to be paired. None of my friends owned one. The only dogs I ever played with had CKC papers, well-known pedigrees, and fancy long-winded names like “Articlight Kennel’s Midnight Whisper”. (This was actually my childhood dogs’ registered name.) When I pictured myself getting my own dog, I always thought I’d have a pure-bred golden retriever purchased from a famous breeder. Mutts were for people who didn’t care enough about dogs. Obviously, I was very wrong. I am so glad my mind was changed somewhere down the line. But I think this stigma still remains. The reason I don’t see that many in our classes is because people still think less of mutts than they do of their single-breed counterparts. Agility handlers want shelties or border collies, dogs they know will take to the sport. They are reluctant to take a chance on a dog they know nothing about. But today, in honour of Mutts Day, I declare my pride in my mixed breed mutt. Shiva can do everything a pure-bred dog can do. She may not come from impressive stock, we many have no idea who her parents were, and she may have been found wandering on the wrong side of town, but she can mix it up with the best of them. When it comes down to it, regardless of heritage, they are all just dogs. So Happy Mutts Day to you all, whatever your dog is. I hope you were able to get out to celebrate together! Fun topic. I think we too will celebrate. This is especially interesting for me because of my work with pit bull type dogs. I say pit bull type dogs and not pit bulls or “american pit bull terriers” because of how hard it is to really identify a true APBT visually — most dogs in shelters are identified as pit bulls or pit mixes, and most dogs identified as pits are mixed breeds that may or may not include APBT. It’s so interesting and so confusing. Our Chick, for example, was identified as a pit bull by the shelter. His DNA test revealed that he is half american bulldog, half english pointer mix. Lollie was identified as APBT, but my gut says she is at least 1/4 English bulldog. Gonzo? Obviously half bunny-rabbit or maybe French bulldog. TANK we think was part Dogue de Bordeaux or some other large mastiff, but he was called APBT also. Now Stevie? I have to think she has some greyhound or whippet in her. We’ll have a special toast tonight to all the Heinz-57s in our life. Thanks Kristine! Mutts are also less likely to suffer from hereditary health problems. I’d guess they have longer life spans than pure breds as a result. That is so funny! Growing up I thought that full breed dogs were just for “snobs” & that mixed breeds were the “real” dogs 🙂 Obviously, we love all dogs & have a houseful to prove it! I recently found a book about mutts that is very interesting;The Underdog: A Celebration of Mutts, promotes adoption & has pictures of some really cool mixes. Happy Mutts Day! It is wonderful that you found Shiva and she found you. Hooray for mutts! I’ve never had anything other than a mutt! Purebreds had always given me a bit of the heebie jeebies because they remind me of the fact that people would buy a dog from a breeder when so many are suffering in shelters:) But I am now trying not to hold it against them, since I know so many pure breeds are super nice dogs. Plus, I hear 1 in 4 shelter dogs is a purebred! My sister loves Akitas and her current one came from the same shelter as my oversize pit/presa canario/plott hound/greyhound (?) mix. What I LOVE about my mutts (one of many things) is that they are both so recognizable. I’ve met ONE dog in the thousands i’ve ever met who looks like shayne (a lot like shayne… slightly different shape and more coat but close enough where theyv’e been mistaken for one another) and the only dog that has even SORT OF resembled rio was his litter mate. Now it stinks a little because i can’t get mass-produced “i ❤ my ________" bumper stickers w/ the fancy silhouette but that's okay… search cafe' press long enough and i found a cool acd/whippet shirt http://www.cafepress.com/+cattle_dogwhippet_white_tshirt,51869899 and a quick photo edit and you can make your own silhouette image to go on a bumper sticker. Happy Mutt Day Shiva! It's a day JUST for you! BTW, I didn’t know about Mutts Day. Thanks for the tip–this will definitely be my new favorite holiday! I have never heard of mutts day, but I will raise my glass. It was interesting to get your ideas about mutts, we have always had mutts and never owned a purebred until we got one by accident. Yes, Delilah was supposed to be a lab mix, but turns out she is pure. Go figure. Growing up we were too poor to own a purebred so we always had mixes. I didn’t think anything of it. Sampson is Golden Retriever/Labrador Retriever and the best dog I have EVER known. I didn’t set out to get a mix (he was supposed to be a golden, but nature intervened)but it was the best thing that could happen to me. Happy Belated Mutt’s Day, Shiva. You rock! I’ve known 6 dogs (7 with my brothers dog) and all but Song have been mutts. They were all fab dogs. Really unless you want to show a specific breed, I don’t think it matters. One thing insurance is cheaper for a mutt. I’d never heard there was a Mutt’s Day! Very cool! I’m not sure why there’s a discrepancy between the number of mutts out there versus the number of dogs enrolled in certain activities, but I wonder if part of it is the nature of the organization of breed registries. Most competitions are run by the AKC, CKC or UKC around here, and for a very long time, they have excluded mixed breed and unregistered dogs. It hasn’t been until recently, when the AKC saw there was money to made from it, that they started their programs that mutts could compete in. And besides, though he claims that Rikki is full Jack Russel, Mom and I disagree, and Rikki has no papers. Ha ha. So Dad has obviously loosened up over the years. You’ve made me want a mutt now. 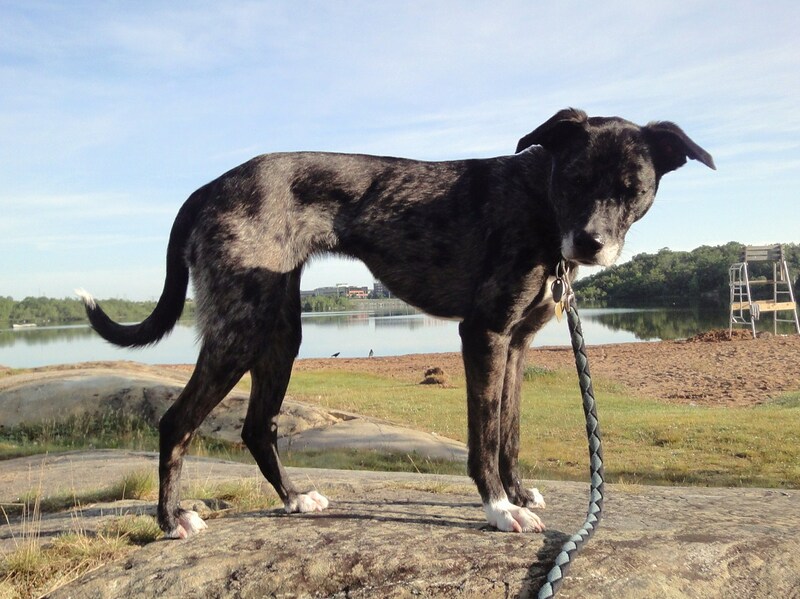 I happen to quite enjoy guessing breeds of dogs in mixes, but now I kinda want a skinny merle dog with no recognizable heritage, too, lol. My first dog was a mutt, a Lhasa Poo from an “oops” litter. I’ve also had a Am Staff and a Pittie Cross, and now, a Vizsla. They were( are) all good dogs and I loved them all. While there are arguments for both sides of mutt vs. pure breed, what really matters is how much you love your dog. Yeah, I love mutt day! And your timing was perfect, actually. The North Shore Animal League designated August 1 as the day you can celebrate your dog’s birthday if you don’t know when she was born. So I think your post was very well timed. Shoot! I was driving home from vacation yesterday and missed this! I definitely would have celebrated! I fear the idea that mutts may become a thing of the past. So many defects have been bred into purebreds over the years that I’d almost be afraid to get one. At the same time, you don’t want more dogs in shelters because the Jones’s sheltie got too friendly with the Smith’s Yorkie. I don’t know what will be, but I don’t think we have to worry about losing our mutts for a while. yup, they are all dogs first. One reason you may not see as many mixed breeds is people are not aware you can compete with a mix in some venues… and I think it is actually harder to find agility training for dogs that are mixed because it’s not something people make a point to point out in the info. At least that’s what i find here, we are soooo AKC driven it’s not even funny, and honestly I think the AKC is partially at fault for some of the problems in the “purebreds” these days. But we won’t get into that, I have nothing against mutts/mixes and who knows one day we may own one. But since we both were looking for using our dogs to fulfill a purpose or at least attempt to, we went with a purebred. To each their own, and I agree I doubt there will be much of a decrease in the mutts running around. Heck over on this side of the border people are crossing breeds with poodles on purpose and selling for purebred prices…But i will SO not go there right now.. one day I think I’m going to pull out that soapbox though. What kind of dogs do you think Shiva is mixed with? I know it doesn’t really matter, but it’s still fun to guess. I see pitbull and cattle dog.